In November 2012, NCF participated in the #SciFund Challenge – a crowdfunding entertprise to help use raise money to support our spotted turtle research at our Medouie Creek property. You can read all of about the challenge here. Since the beginning of April, Danielle and our field assistants have been scouring the Medouie marsh looking for turtles to become the lucky recipients of brand new radio transmitters! Now that the salt marsh restoration is progressing after 4 years, we are returning to Medouie to evaluate how spotted turtle habitat has changed and how the turtles are responding. So far, we have placed transmitters on the shells of 5 turtles at Medouie and we hope to find at least 3 more to track this summer. Each turtle we track has a unique personality and we want to introduce you to 4 of the turtles we will spend time following this year. Some of our wonderful SciFund donors have named these turtles for us—see what they are doing so far and stay tuned to see what they will be up to over the field season! Turtle 159 “Waldo” – named by Matt and Nora Kelly. Waldo is the perfect name for this turtle as he is constantly right under our nose but we can never see him! 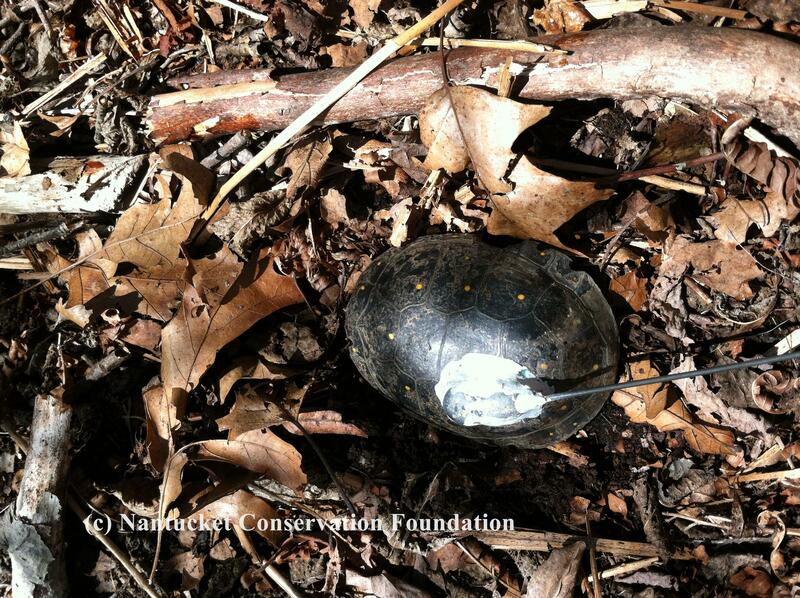 Waldo is the only male turtle we are tracking so far this season. We originally captured him at Medouie in 2009 and we recaptured him this year on May 2nd in a small vernal pool surrounded by several large red maples in full crimson bloom. This turtle is excellent at burrowing down several inches under the mud making him impossible to find. On May 22nd, however, he finally emerged from the shrub swamp and made his way in to the northern part of the cattail marsh. We’re eager to see where he ends up this season. 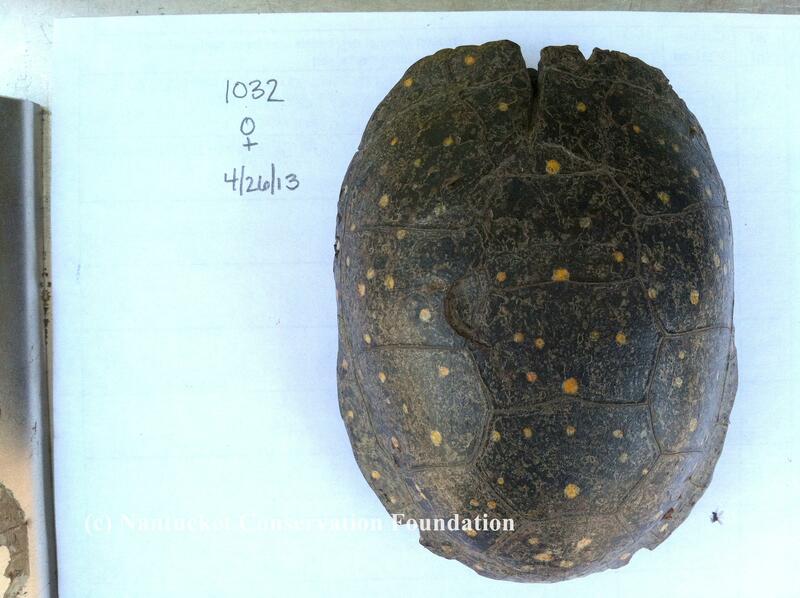 Turtle 1032 “SheRa” – named by Betsy Taylor. 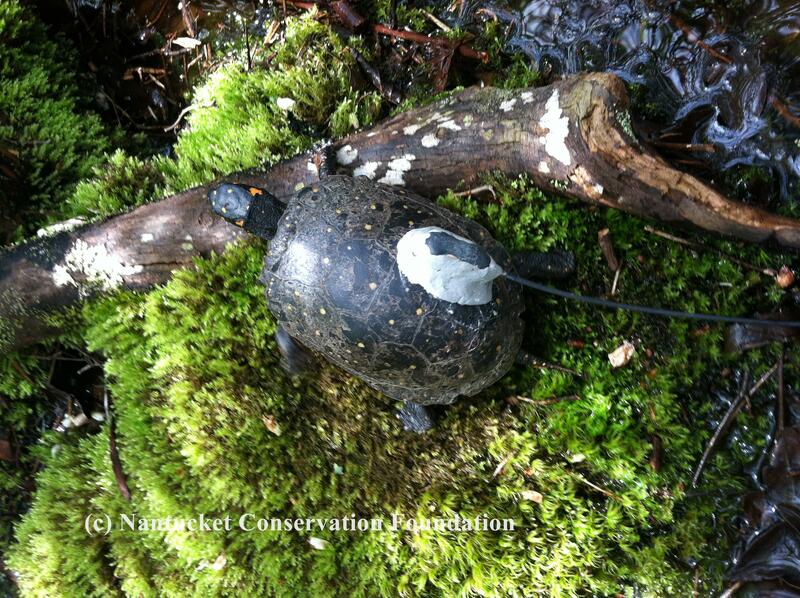 SheRa is, so far, the only turtle we are tracking this year that we also tracked in a previous year. She was originally captured and tracked at Medouie in 2010. We recaptured her this season on April 26th and once again placed a transmitter on her. We are very curious to follow her this year to see how her use of the marsh compares to her movements in 2010, particularly now that the restoration of Medouie Creek is well underway. SheRa is certainly a suitable name for this turtle – not only she has been our busiest and most active turtle this season, moving from pool to pool, but she has also apparently endured some trials in life. As you can see from her photo, she has quite a large cleft in the top of her carapace, likely from a run in with a lawn mower in the past. And, she is our rockstar for enduring two field seasons with a transmitter on her back! So far this season SheRa has been revisiting some of the same pools and shrub swamps that she was found using in 2010! Turtle 232 “Barnacle” – named by Robin and Aiden O’Dell. On April 26th, we recaptured Barnacle in exactly the same location where she was originally captured in 2009 and she was hanging out with the same turtles we originally found her with – all found basking in the sun on one of the first warm sunny days this spring. 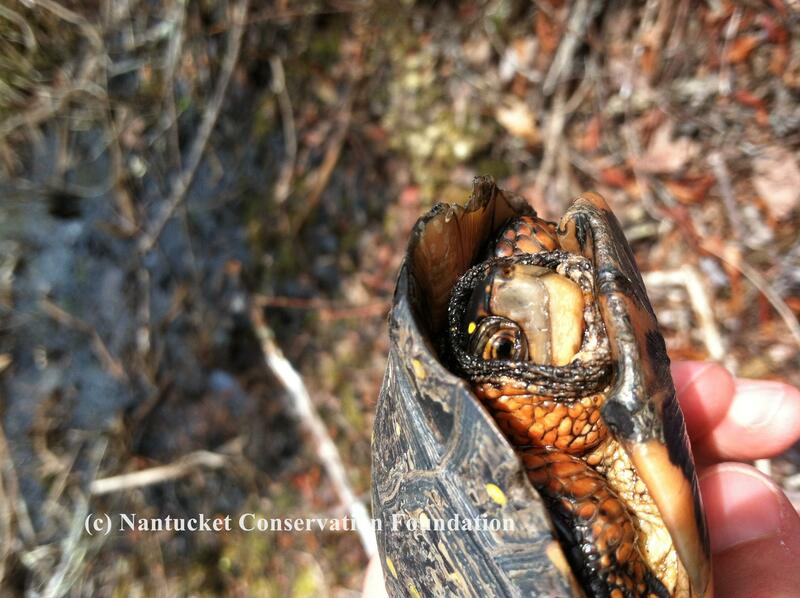 She has been quite the social butterfly – she is almost always found with at least one other turtle. She prefers one particular small vernal pool with very dense winterberry holly and wild fox grape. However, she just moved out of that pool and into the northwestern portion of the cattail marsh. We are anxious where she goes next! Turtle 2004 “Minion” – named by Brandon and Meg Gheen. Minion was the first turtle we recaptured this season. She was originally captured at Medouie in 2009 but this will be the first year that we’ve placed a radio transmitter on her to see how she moves around the Medouie wetland. Up until May 22nd, she has remained in the same small pool where we found her but she has been notoriously difficult to find as she likes it best in the middle of the densest highbush blueberry and winterberry holly – perfect turtle habitat but terrible for humans to move through– Minion is a name that suits her just fine! While she hasn’t moved much so far, on May 22nd we found her out of the water and headed towards the Medouie marsh so exciting things might be in her future! 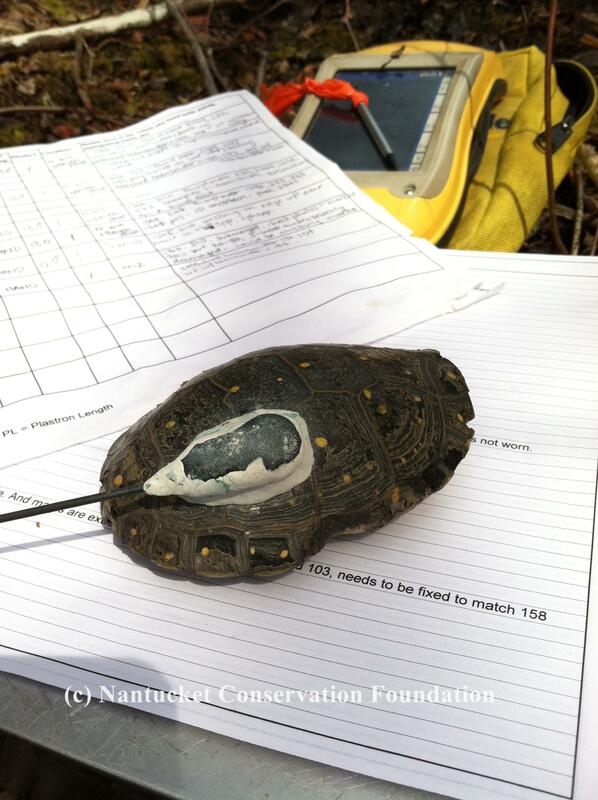 This entry was posted in SciFund and tagged #SciFund, Medouie, salt marsh restoration, spotted turtles, tracking turtles. Bookmark the permalink.